Our brochures are available in Adobe PDF format. Your computer must have Adobe Acrobat Reader installed to view the brochures. Use the KwikAz 'Coverage and Cost' Calculator to help calculate the cost and coverage needed for your job. 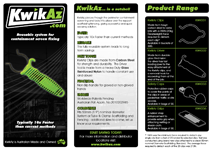 Use the KwikAz 'Labour and Saving' Calculator to help calculate the labour and costs saved by using KwikAz.